Applicants for admission to the UMKC School of Medicine MSA program must have the CASAA application submitted and verified by August 15, and all other applications and application materials must be submitted by August 15 as well. Students offered admission to the MSA program will matriculate in January. An application will NOT be reviewed for admission until all supporting documents have been received. When all applications and application materials have been received, the MSA Program Admissions Committee will review all complete applications. Application materials received or postmarked after the final admissions deadline will be considered late and those applications will be reviewed with other late applications and only if space is available. Applications that remain incomplete will not be considered. All applicants must apply through CASAA, which becomes available in March. Please follow the instructions provided on the CASAA application. Once the application has been verified by CASAA, it will be sent to the programs to which you have applied. The CASAA application must be submitted and verified by August 15. Official MCAT/GRE scores must also be received by August 15. Official MCAT/GRE scores must be released directly to CASAA. The School of Medicine participates in the CASAA letter of recommendation program, and all letters of recommendation must be submitted through the CASAA letter of recommendation service by August 15. Letters of recommendation sent directly to the School of Medicine will not be accepted or used in the admission process. Reference forms or letters of recommendation should be submitted by faculty, advisors, school administrators or others who can speak to your academic ability and personal character as they relate to your pursuit of the Anesthesiologist Assistant profession. Family members and/or friends of the family should not provide letter of recommendation. Three professional or academic letters of recommendation are required. References are considered confidential material at the UMKC School of Medicine; information provided on reference forms or in letters of recommendation will not be shared with the applicant. All applicants must complete the General Application for Admission. Please follow the instructions provided on the application. When selecting a major, select “Anesthesia – MS.” The application and $50 application fee must be submitted by August 15. Experience shadowing an anesthesia provider (Anesthesiologist Assistant, anesthesiologist, or CRNA) is required prior to the application deadline. A minimum of 10 hours of shadowing is required. To successfully verify shadowing experience, applicants must either have their shadowing experiences verified electronically by the shadowing provider or use the electronic Shadowing Experience Verification Form provided through the MSA Student Portal (after the CASAA application has been verified). To verify a shadowing experience electronically, an applicant will need to list the name(s) and email address(es) of those providing a shadowing experience verification form in the MSA Student Portal. After entering the information for each person electronically verifying the experience, an applicant will need to click “Send Email Request” in order for the person providing the verification to receive instructions for completing the online MSA Program Shadowing Experience Verification Form. To verify a shadowing experience with the Shadowing Experience Verification Form, applicants must download, print, and complete the information at the bottom of the form. After completing the information, ask the provider who supervised your experience to sign and date the verification form. An applicant will need to list the name(s) and email address(es) of those providing a shadowing experience verification form in the MSA Student Portal (after the CASAA application has been verified). The PDF form should then be submitted directly to the MSA Student Portal. Once the MSA Student Portal has been submitted, no changes or additions to the MSA Student Portal, including the shadowing experience section, may be made. All applicants must submit the MSA program Technical Standards. Once the CASAA application has been verified, applicants will receive information related to the electronic completion of the Technical Standards. Applicants will not receive this information until they have been verified by CASAA. By receiving the information related to the Technical Standards, applicants will gain access to the MSA Student Portal. In the student portal, applicants must sign the technical standards and complete a final submission of the MSA Student Portal. The final submission cannot be completed until the CASAA application has been verified, the General Application for Admission to UMKC has been processed, the Shadowing Experience Verification Form has been completed and the Technical Standards have been signed. Applicants can only complete the final submission after all application components are marked as complete in the MSA Student Portal under the Supplemental Application tab. All applicants must submit official MCAT scores to CASAA after self-reporting their MCAT scores and entering their AAMC ID number into the CASAA application. Applicants should contact AAMC to request their official scores to be released to CASAA following the self-reporting of their score and identification information. Applicants must release official GRE scores from ETS via the UMKC CASAA code: 4410. After the review of all applications, the admissions committee will determine which candidates are selected for an interview. If selected for an interview, candidates are required to be present at the date and time of the interview. All candidates invited to interview must interview in person at the School of Medicine. No phone interviews are permitted. After all selected candidates have completed the interview process, the admissions committee will extend offers of admission to those candidates who best qualify for the program. A holistic and individualized process is used when considering candidates. Candidates will be notified in writing of the program’s decision regarding admission. 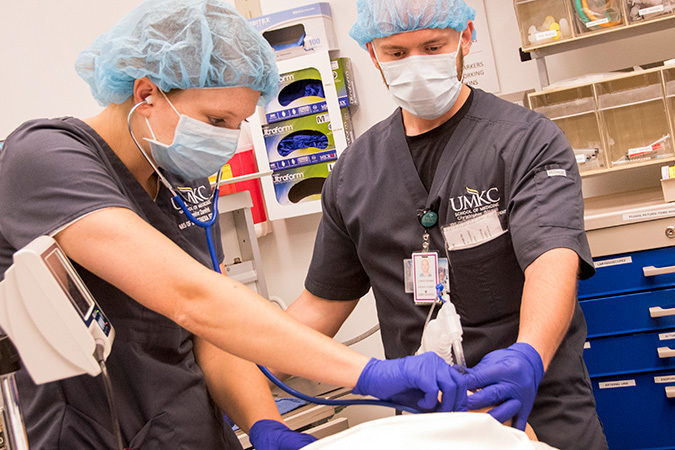 Admission to the Master of Science in Anesthesia program is based on a combination of academic performance and demonstration of other non-cognitive characteristics including: professionalism including reliability and accountability; honesty and integrity; compassion and respect; maturity including tolerance of anxiety and stress management; leadership; motivation for providing health care; and co-curricular and work experience. If you have any questions about your application or the application process, please do not hesitate to contact the School of Medicine Office of Admissions at 816-235-1870 or medicine@umkc.edu. August 15 is the final deadline. The CASAA application must be verified by this deadline, and all accompanying CASAA required materials must be received (official transcripts, official test scores, and reference forms). The General Application for Admission to UMKC is also due by August 15, and the UMKC MSA Student Portal submission, including acknowledgement of the Technical Standards and completion of the Shadowing Verification sections, must be complete by August 29. If any of these materials are submitted after the deadline, the application will be considered late and reviewed with other late applications at the discretion of the admissions committee. The admissions committee does not guarantee the review of applications that become complete late. Incomplete applications will not be reviewed. Once admissions decisions have been made, no other applications for admission will be considered.